Determine how the Salesforce personas map to your organization’s users. Develop scenarios using your personas. Incorporate personas into your design and development process. Discuss how you'd use personas in your organization. As you now know, personas help us better understand the real people who use your products—getting at your users’ work behaviors and the tools they use to get their jobs done. We’ve also walked through more than a dozen personas related to sales, service, and marketing. But how do you actually use them in your business? That’s what this unit is all about. How people in your organization use Salesforce? How you could help them use it better? Anyone who’s making design decisions can use personas to help ground those decisions in real user needs. By representing a meaningful group of users, personas make sure you don’t design too narrowly to one person’s individual needs. At the same time, personas are specific enough so that you aren’t left with only a vague sense of your users and their needs. We’re sharing the Salesforce cloud-based personas with you here because they’re really useful for understanding your users’ behaviors and needs. If you’re interested in doing some of your own more exploratory work, we recommend checking out the Innovation the Salesforce Way trail, which talks about doing your own research and creating archetypes to drive innovation. You can also use personas to help you articulate who you're not designing for. In some cases, a feature isn’t used by all of your users, and it is helpful to explicitly acknowledge that this group of users doesn’t need to be considered in the design process. Now that’s a time (and headache) saver! The Salesforce personas you learned about in previous units are based on data gathered from thousands of Salesforce users. You may need to do some work at your own organization to understand how your users map to these personas. To do this you can put some of the skills you learned in the UX Research Basics module to work. Conduct a survey or interview your users to see how they map to the personas in this module. Your goal is to discover which activities they do the most. We’ve added an example survey in the resources section—use it to help map your user to Service Cloud personas. You can adapt the survey for mapping your sales and marketing users. Alas, you may find some differences in the way your organization does work. So think of these personas as a baseline and work in other activities if you find that they're important to your organization and users. Note: Remember what we talked about in the Introduction to Personas unit: It’s totally OK if at your organization one user maps to multiple personas! Once you understand how the Salesforce personas apply to your users, you can use these personas to develop user stories. Next we’ll talk about how user stories help you clarify user needs. A powerful way to bring personas to life, and use them to make design decisions, is through user stories. A user story describes a specific task or activity using one of your personas. Remember the activities and goals we talked about for each persona? These form the basis of your user stories, with the personas as the stars. A user story is told from the persona’s perspective. It includes the persona, one of their top activities, and their motivations and goals to provide more context and make the story come to life. Let’s walk through creating a user story together. Say you're working on adding some customized fields to the Activities object in your Sales Cloud. First, make sure you’re targeting the right users with these updates. We know that logging emails, calls, and notes is a top task for Deal Closers, Pipeline Builders, and Trusted Advisors. OK, now that we know who the stars of our scenario are let’s write their stories. All three of these personas are focused on both maintaining and expanding existing customer relationships and prospecting for new customers. As a Deal Closer I want to log all of my interactions with my customers so that I can follow-up and provide the information they need to make a purchasing decision. As as [Persona name] I want to [Task I want to do] so that I [Impact of completing this task]. Now that we’ve covered the Salesforce personas, mapping them to your users, and using them to create compelling user stories, let’s talk about how to make these personas and stories part of your organization’s design and development processes. What are we really trying to do here? Make better decisions. If teams have a shared understanding of who they're building for—including their users’ needs and behaviors—then they can consistently make better decisions about product priorities. This shared understanding also tells you which users should help test and validate specific features. In the UX Research Basics module we talk about telling stories with your research findings, but here’s a quick summary: You’re more likely to get buy-in for your recommendations if you tell compelling stories that connect to your stakeholders’ motivations and the decisions they're making. But how does this relate to personas? Now that you’ve gotten to know the Salesforce personas, why not introduce them to the team you will be working with to implement or update your Salesforce org? Set up a meeting to share the personas that are relevant to your organization and work on creating user stories together. Print out and share the persona decks from this module by posting them in work areas and meeting rooms. Integrate the personas into your prioritization decisions by working with your team to determine who your primary persona is. You should typically have one primary persona (you may have two, but any more than that and your scope may be too broad). You might also have secondary personas, these could be users who will use the same user interface (UI) but maybe less frequently. Use your primary persona to help you make decisions about what updates to prioritize. 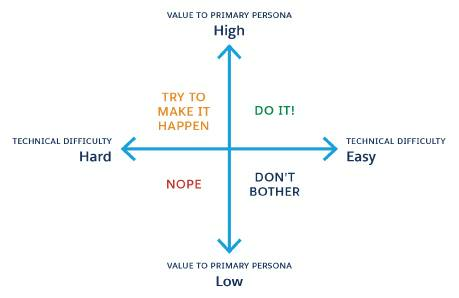 The table below is a prioritization matrix and is one simple tool you can use. There are three key places where personas can add real value to your company: making smarter roadmap decisions, tailoring your engagement with users, and conducting more targeted research. Purchasing and licensing —Personas help by giving you a sense of the tasks your different users carry out and what features they need access to. Custom features —Personas help you prioritize work by identifying who might need a feature and how critical it is to their work. Personas can be used to tailor trainings, events, and activities with users. For example, based on their personas, you could include your users in trainings for the features that are relevant to their key activities. Your users will love that you’re saving them from attending unnecessary trainings, and that the trainings they do attend are more relevant to their work. Personas help you conduct more targeted research by selecting the right participants to help you test specific features. When you test features with the most relevant users, you’ll have higher adoption of the features you build. It’s been a wild ride through the land of personas. You’ve learned all about Salesforce personas, how to map them to your users, and how they help you and your stakeholders develop a shared understanding of user needs. You’ve also learned ways to integrate personas into your design and development processes to add value to your organization. We can’t wait to see how you use them to make your organization’s Salesforce instance better than ever!